The new year is in full swing which means important dates need to be marked for the next 12 months. In the telecommunications sector, there are a few annual events that define each year — events such as Africacom and The Mobile World Congress and of course the Carrier Community GCCM. Carrier Community (CC) is a global telecom club established in 2008 and organising annual global carrier community meetings in London since 2008 for the members. 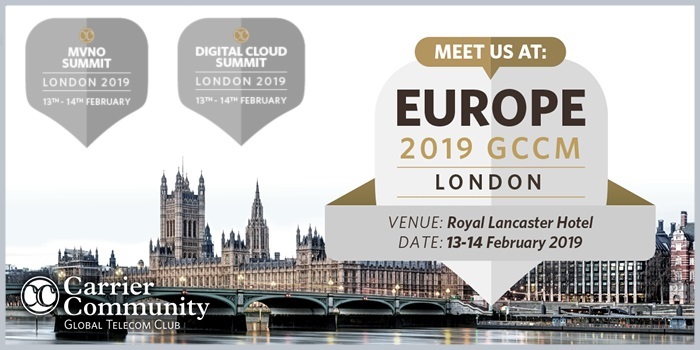 This year will see the 11th annual EUROPE 2019 GCCM hosted in London on 13th & 14th February 2019 at the Royal Lancaster London Hotel. Organisers have stated that they expect to see over 900 club members from 450+ telecom operators and 68+ countries represented in the attendees with decision makers from the Tier-1, Tier-2 and Tier-3 meet and network in London. As a long-standing and trusted member of the Carrier Community, iTouch will be in attendance at this year's event with our CEO Greg Brophy as the representative. What is the significance of the GCCM? CC is bringing together members and Telco Eco-Partners from various segments such as Data, Cloud, Application Providers, Voice, SMS Messaging, Mobile, OTT/ Content Providers, VAS, Submarine Cable, Enterprise, Satellite, ISP, Data Centers and other related segments. The GCCM offers meeting and networking with peers and exploring new business opportunities, discussing latest market trends at the panel sessions and showcasing their latest solutions. The GCCM aims to build a bridge between various CC members, predominately from the wholesales telco service provider arena and cloud, submarine and MVNO operators. This year CC has decided to organise in parallel its annual CC –Digital Cloud Submarine and CC-MVNO Summits at the Royal Lancaster London Hotel in different ballrooms to enable all to meet, share knowledge, network, explore and close deals. The GCCM will be filled with some exciting keynote addresses as well as panel and roundtable discussions. If you're interested to know what exactly is on offer, then you can find the complete agenda for the 3-day London CC summit here. Who are the Carrier Community? Carrier Community is an exclusive global telecom club and industry networking platform for wholesale telecom service providers, including sectors such as Voice, Data, SMS, Mobile, Datacenters, VAS, MVNO, ISP, Cable Subsea, Telehouse and other related industries. Since its launch, our telecom club has qualified more than 8000+ members, representing 2300+ operators from more than 120 countries. Our members occupy C-Level, VP, Director and Manager Positions at incumbent, mobile and alternative and small operators. Carrier Community offers the industry a meeting place where members can share ideas, contacts and business information. Members can connect with their peers, have access to the latest industry news, publish articles and advertise their companies on the club publications, attend various members conferences globally and other benefits. While the London forum kicks off 2019, there will be other editions of the GCCM hosted throughout the year in venues across the globe from Berlin to Cape Town.